Living in the heart of Downtown Des Moines (DSM), the city around me feels like an extension of my home. The restaurants on Court Avenue are my dining room. The Riverwalk is my backyard. Cowles Commons is my living room. And lucky for me, my living room has a piano. It’s one of 10 public outdoor pianos across the Metro, managed by the non-profit City Sounds. I’m a lifelong musician with an unhealthy addiction to learning new instruments. Last summer, I had a sudden urge to start playing the mandolin. This summer I hope to conquer the drums. But the piano is my first and most loved instrument. Having played the piano since I was five, it simply doesn’t feel like home without a set of keys in the corner. I’ve long wanted one in my house, but never had the space. 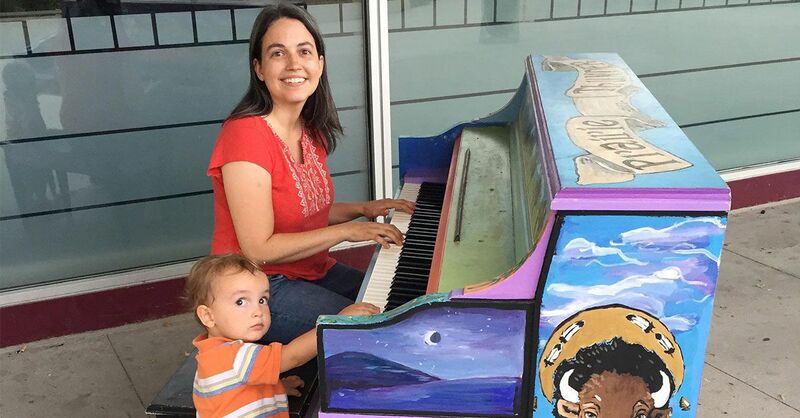 So I’ve adopted the Cowles Commons piano, just one block from my home, as my piano. 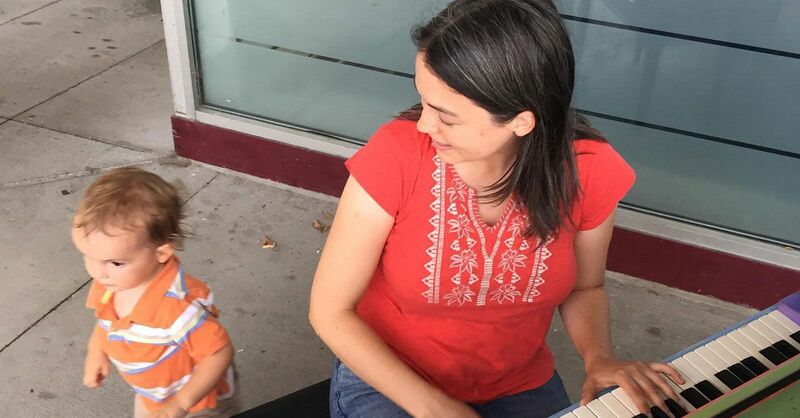 I stop and play a few chords on my walk to the grocery store or take my two-year-old there to pound on the keys as loud as he wants. I listen to an impromptu concert by a stranger, or lean against it while chatting with a friend I’ve run into (I swear I can’t get past that corner without seeing someone I know). The space feels like another room in my house. Public spaces like this is one — where people feel a sense of comfort and connection — are the cornerstone of a great city. When I’m not playing the Cowles Commons piano, I’m a professional city planner, so I know there’s a pile of research and countless success stories to explain all those good feelings I get when I’m sitting at the piano. Great public spaces — like Cowles Commons, the Riverwalk, or the busy sidewalks of the Historic East Village (two of the other piano sites) — improve our connection to our community and are shown to boost economic vitality. They encourage spontaneous interaction with our neighbors. They increase our willingness to invest in our community through volunteerism, philanthropy and support of public projects. Public spaces — and the events, people, and pianos inside them — give us a strong sense of place. They help us know where we are and who we are as a community. These are the things that make people want to live here, to start businesses here, to raise families here. I know all that is true for me at least. Sitting at “my” piano, looking out at children splashing in the fountain, waving at my neighbor walking their dog across the street — this is what I want out of my city. Public pianos encourage us to bring a part of our private lives into the public realm. They invite people to make themselves at home in a public place, to share a piece of themselves with their neighbors, to stop and talk to each other, and to live their lives out on the sidewalk, just as much as they do in their own living room. They make our city — every part of it — feel like home. Want to learn more about living in DSM? Find out about all the region offers.